To Klabusich herself when she came to us posturing as an objective journalist for comment: "The political positions and experience of Stop Patriarchy are widely publicized on our website. 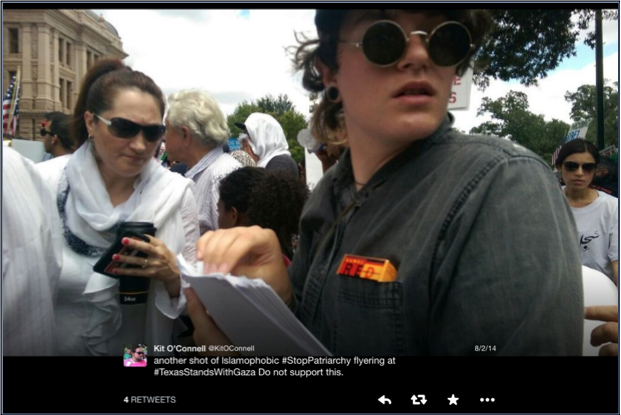 As per your questions for your article, Katie Klabusich, you are not a legitimate journalist - you have repeatedly made clear that your intention is to destroy this movement. 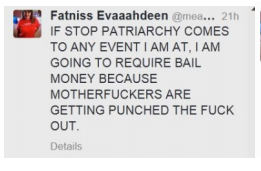 In your initial #FuckStopPatriarchy writing you concluded: "We have precious little time on this planet; I implore you to find a better use for yours than joining with, reading, supporting or even (after this) listening to anything about Stop Patriarchy." Once again, Stop Patriarchy would be happy to hold a public dialogue/debate at an agreed upon unbiased setting, over how to get off this losing trajectory and defeat the war on women." 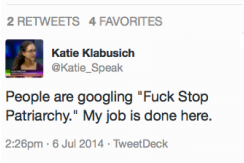 In the last 6 weeks Katie Klabusich has initiated over 100 tweets that either attack or misrepresent Stop Patriarchy's organization, suggest that Stop Patriarchy is “stealing” funds, that Stop Patriarchy lied about their intent, that Stop Patriarchy is not welcomed by anyone in Texas, and that Stop Patriarchy is racist, anti-LGBTQ and Islamophobic. Her sources for these attacks remain unclear. Moreover Klabusich has endorsed the efforts of others who are trying to or have posted pictures of Stop Patriarchy members, retweeted and supported others who have threatened Stop Patriarchy, claimed she has to "save" her movement, and has thanked her friends for doing interviews that discredit Stop Patriarchy.